Art Gallery featuring fine art in a huge variety of mediums from multiple fine art vendors. You can also consign art with us and we buy art. 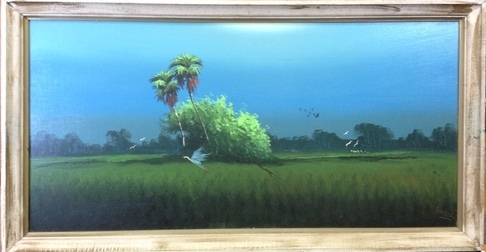 Alfred Hair Florida Highwaymen piece from our art gallery in Fort Myers, Florida at Gannon's Antiques & Art. This is a particularly nice piece that personifies the Florida Highwaymen genre that Alfred Hair was an integral part of creating. A. Hair's work is extremely collectible as he is the founder of the group. Inducted into the Florida Artists Hall of Fame on March 24, 2004. He is one of Florida's most sought after artists. This beautiful Florida Everglade scene measures about 24" X 49" and is certain to be a highlight in any advanced collection. We also buy Florida Highwaymen pieces and offer free fine art appraisals. You can also see more on our fine art on our Alfred Hair Florida Highwaymen blog post! Creator Bruce Brayton worked in his creative chambers for 9 months creating the graceful 5’3” slender, long legged female. She began as raw materials of stainless steel rods, tubing, and sheet. Referring to medical books and ballet poses. With welding tools and fire he created a anatomically correct ballerina called Burree’ (named after her ballet pose). Her muscles have been created using wire, her bones are tubing, her eyelashes, pelvic bones and ballet slippers are created from sheet. She contains three different forms of alloys (304,308,316). She is a vision of race, power, dedication, determination, perseverance, and undeniable skill of the creator. You can see more of this piece in our "Burree" blog post. Here's a new addition to our Art Gallery artist Brenda Berdnik featuring some very unique fine art pieces. These are some photographs of Brenda Berdnik's section in our Art Gallery. You can see her work and other pieces of fine one of kind art on display in our showroom. You can also visit our Brenda Berdnik Blog Post.